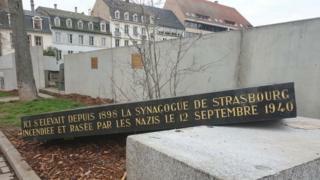 A memorial stone at the site of Strasbourg's old synagogue has been vandalised, the deputy mayor of the eastern French city says. Alain Fontanel tweeted a picture of the marble slab after it was knocked off its plinth, calling the attack a "new act of anti-Semitism in our city". The memorial stands at the site of the synagogue, which was burned down by the Nazis in September 1940. Last month dozens of graves were desecrated at a nearby Jewish cemetery. Swastikas and anti-Semitic slogans were spray-painted on the graves. 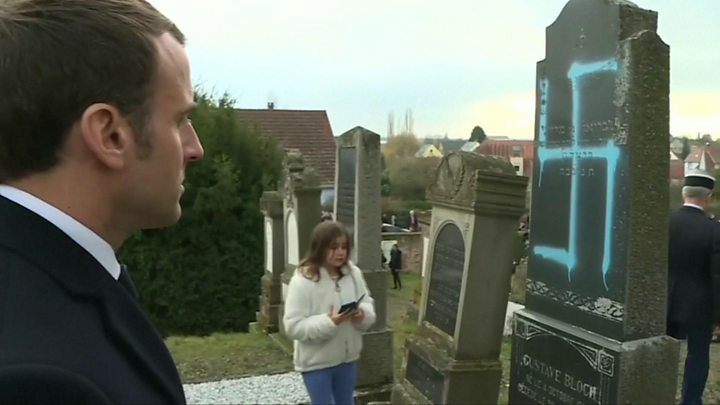 President Emmanuel Macron visited the cemetery in Quatzenheim, about 20km (12 miles) west of Strasbourg. He expressed his "total determination to fight anti-Semitism in all its forms". After the latest incident in Strasbourg, Mr Fontanel said: "Sadly, history repeats itself." He said city officials and police were doing everything possible to catch the attackers. Is anti-Semitism on the rise in France? Statistics published last month showed a rise of 74% in the number of anti-Semitic attacks in France, from 311 in 2017 to 541 in 2018. Several high-profile recent incidents have brought the issue into focus. In one instance, a Jewish bakery in central Paris had the German word for Jews ("Juden") spray-painted on its window. Also last month, police also stepped in to protect the philosopher, Alain Finkielkraut, after he was bombarded with anti-Jewish taunts by a group of "yellow vest" protesters in Paris. Crime data from Germany released last week revealed that anti-Semitic offences had increased by 10% over the past year - including a 60% rise in physical attacks.